In Issue 50 of the Baba Indaba Children’s Stories, Baba Indaba narrates the Celtic story about how a hard-hearted woman shoos away a stray dog and how another woman shows kindness and compasion to another. The tale tells of which of the two women the fairies rewarded and whom they did not. In Issue 49 of the Baba Indaba Children’s Stories, Baba Indaba narrates the story about the fairies who borrow household items from an old woman but who always leave a gift in payment. The old woman comes up with plan to outfox the fairies and get them to use their magic to achieve her own selfish ambitions, but with disastrous consequences – for we all know you can’t outfox a fairy. Look out for the moral in the tale. In Issue 44 of the Baba Indaba Children’s Stories, Baba Indaba narrates the old European tale of the tailor who through guile and cunning eventually wins the hand of a Princess. Download and read the story to find out the details of just how he achieved his feats. In Issue 33 of the Baba Indaba Children’s Stories, Baba Indaba narrates the old English tale of old Toonie whose greatest wish before he died was to see a fairy. It was well known that in order to see a fairy three things are needed—a handful of courage, a mouthful of silence, and a capful of moonshine. But will old Toonie’s wish ever be granted….? In far bygone days, there was a widow who had three daughters. The girls lived in a tiny house in the forest. A tiger was also in the forest and watched out for the girls, hoping to hunt them down. One day, the mother said to the girls, Ill go out to look for food. Dont go out and dont let anyone in. Then she set off. This is me, your mother, replied the tiger. May I see your eyes? Why are your eyes so red? enquired Ma Gyi. I was worried about you and cried on the way home, answered the tiger. May I see your hands? Why are your hands so big and dirty? The tiger replied, I helped with planting on a farm and so my hands became dirty. The girls unwisely opened the door and then ran away and climbed a tree while the tiger chased them. The tiger asked, How can I climb up? Ma Gyi gave a tricky response, Pour oil onto the tree. The tiger went back to the house, brought some oil and poured it onto the tree. However, it could not climb up the tree as it was so slippery. Then Ma Gyis sister, Ma Nge shouted, Chop the tree down with an axe. The tiger got an axe and started to chop the tree down. The girls were very fearful and cried out to the Lord of the Sky to save them. The Lord of the Sky sent down a basket and a rope and the girls went up into the sky. The tiger made the same request and climbed into another basket going up into the sky. However, the rope was old and finally broke and the tiger fell to the ground and died. The girls became as fairies of the Sun, Moon and Stars. 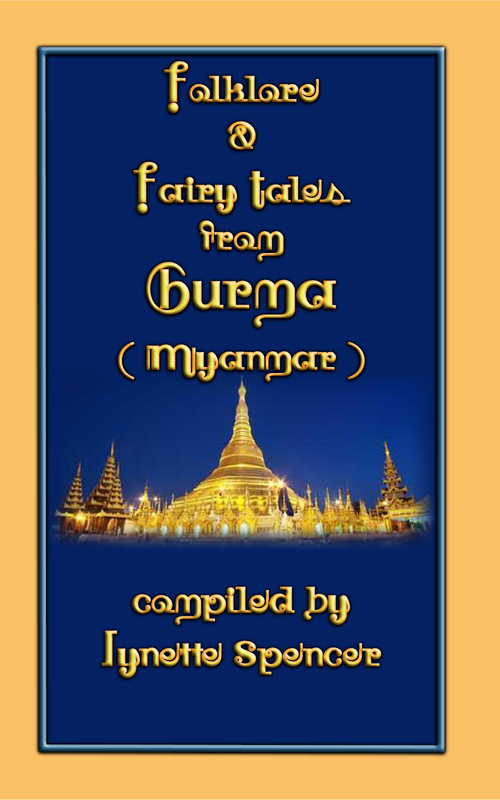 55% of the net profit from the sale of this book will be donated to the Phaung Daw Oo Monastic Education High School, Mandalay to assist with teaching materials. Once upon a time, the Ojibways were a great nation whom the fairies loved. Their land was the home of many spirits, and as long as they lived on the shores of the great lakes the woods in that country were full of fairies. Some of them dwelt in the moss at the roots or on the trunks of trees. Others hid beneath the mushrooms and toadstools. Some changed themselves into bright-winged butterflies or tinier insects with shining wings. This they did that they might be near the children they loved and play with them where they could see and be seen. But there were also evil spirits in the land. These burrowed in the ground, gnawed at the roots of the loveliest flowers and destroyed them. They breathed upon the corn and blighted it. They listened whenever they heard men talking, and carried the news to those with whom it would make most mischief. It is because of these wicked fairies that the Indian must be silent in the woods and must not whisper confidences in the camp unless he is sure the spirits are fast asleep under the white blanket of the snow. The Ojibways looked well after the interests of the good spirits. They shielded the flowers and stepped carefully aside when moss or flower was in their path. They brushed no moss from the trees, and they never snared the sunbeams, for on them thousands of fairies came down from the sky. When the chase was over they sat in the doorways of their wigwams smoking, and as they watched the blue circles drift and fade into the darkness of the evening, they listened to the voices of the fairies and the insects’ hum and the thousand tiny noises that night always brings. One night as they were listening they saw a bright light shining in the top of the tallest trees. It was a star brighter than all the others, and it seemed very near the earth. When they went close to the tree they found that it was really caught in the topmost branches. The wise men of the tribe were summoned and for three nights they sat about the council fire, but they came to no conclusion about the beautiful star. At last one of the young warriors went to them and told them that the truth had come to him in a dream. While asleep the west wind had lifted the curtains of his wigwam and the light of the star fell full upon him. Suddenly a beautiful maiden stood at his side. She smiled upon him, and as he gazed speechless she told him that her home was in the star and that in wandering over all the earth she had seen no land so fair as the land of the Ojibways. Its flowers, its sweet-voiced birds, its rivers, its beautiful lakes, the mountains clothed in green, these had charmed her, and she wished to be no more a wanderer. If they would welcome her she would make her home among them, and she asked them to choose a place in which she might dwell. The council were greatly pleased; but they could not agree upon what was best to offer the Star Maiden, so they decided to ask her to choose for herself. She searched first among the flowers of the prairie. There she found the fairies’ ring, where the little spirits danced on moonlight nights. “Here,” thought she, “I will rest.” But as she swung herself backwards and forwards on the stem of a lovely blossom, she heard a terrible noise and fled in great fear. A vast herd of buffaloes came and took possession of the fairies’ ring, where they rolled over one another, and bellowed so they could be heard far on the trail. No gentle star maiden could choose such a resting-place. She next sought the mountain rose. It was cool and pleasant, the moss was soft to her dainty feet, and she could talk to the spirits she loved, whose homes were in the stars. But the mountain was steep, and huge rocks hid from her view the nation that she loved. She was almost in despair, when one day as she looked down from the edge of the wild rose leaf she saw a white flower with a heart of gold shining on the waters of the lake below her. As she looked a canoe steered by the young warrior who had told her wishes to his people, shot past, and his strong, brown hand brushed the edge of the flower. “That is the home for me,” she cried, and half-skipping, half flying down the side of the mountain, she quickly made her way to the flower and hid herself in its bosom. There she could watch the stars as well as when she looked upward from the cup of the mountain rose; there she could talk to the star spirits, for they bathed in the clear lake; and best of all, there she could watch the people whom she loved, for their canoes were always upon the water. Once upon a time, an old blacksmith lived in an old forge at Craig-y-don, and he used to drink a great deal too much beer. “If you don’t alter your ways of living you’ll die soon; but if you behave better and become a better man you’ll find it will be to your benefit,” and they all disappeared as quickly as they had come.